Not having put out a blogletter 18 for a while has been eating at my conscience, so with another season underway, I thought I would try and get the conversations going again. This will be a short letter, with the aim of eliciting your comments and stories, which is what most participants value. When early summer turned to custard with persistent drizzle, bacterial blight really set in; black nuts everywhere. Some varieties were hit particularly hard. Serr and Meyric were among the worst. Fortunately normal summer weather resumed and gave us a half-crop. How has this season gone for you? Think about it; your experience could help us all. How different varieties respond to the climate and to your region is collective knowledge to build on. Did some varieties have a year off, or maybe conversely, crop better than usual? As the harvesting season unfolded with a near perfect procession of storms to bring the nuts down and dry weather to pick them up, further light was shed on the earlier growing season. Normally a nut infected with blight will be a write-off. This year the blighted nuts were largely O.K. It was a pain getting them out of their husks, but the kernels inside were beautiful; white and very tasty. Hardly any nuts were infected with BAN. Those that were, had rotten kernels as usual. So the interesting thing for me to observe was the different effects of these two diseases, and that will be a consideration in any future disease control. It looks to me that BAN can only do serious damage to the really small nutlets; at the stage you would normally spray at the “praying hands” stage. Bacterial blight seems to be able to infect nuts throughout the growing season, but once the shell has formed, for us in Bay of Plenty at the end of December, the kernel is safe. These are the observations of a simple grower of course and are completely unscientific. One further development this season has me wary. In one block, about one nut per bucketful had an insect exit hole. Would this be codlin moth? We have never had insect damage before, and it is strange that it coincides with our free range chickens, or should I say feral chooks, being wiped out by some stray hunting doges. I hear that a parasite/predator for codlin moth has been released in the Hawkes Bay apple orchards. Does anyone know how to get hold of it? Walnut with exit hole. This often occurred on the suture line, but not always. The decision not to spray was based on economics rather than biology. We sprayed the previous season, the weather was perfect, and the crop double this year’s, and still the return did not cover the cost of spraying, There are two reasons for this. Firstly our spraying costs are high. We have big trees on steep land, so have to use a helicopter. But the main reason is that our yields are too low. That is a result of using unselected seedlings in our oldest block. But most other older grafted varieties would not be much better, with the possible exceptions of Shannon or Roadside 12. We can all learn from stories of dealing with different seasons in different locations. Did your preparations work? We added a dryer. Mark II of our dehumidifier based design, and now wonder how we managed without it. Did you try new systems or new machinery? If you dry your own nuts, can we focus on that in the next blogletter, with pictures and descriptions of how your machine works? 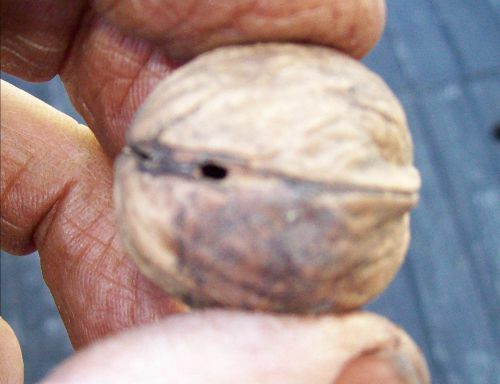 Quite often I get asked, “What walnut variety should I plant?”, and my answer usually is, “It depends.” Not very helpful, I know, so perhaps we can collectively explore this subject in greater detail. 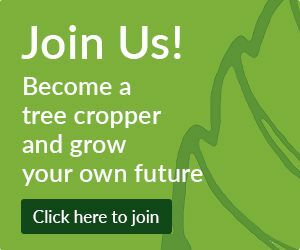 NZ Tree Crops Assn has published results from two different trails, (discussed in detail in the Tree Cropper) one comparing blight in the Waikato, and one looking at yields in the Manawatu. 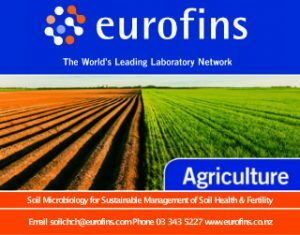 Since the 1970’s, focus for the industry has changed from being solely interested in nut quality, to consideration of different aspects of nut quality, yield in different locations, consistency of cropping, disease resistance, time taken to cropping, seasonal leafing-out-time and even the effect of rootstocks. One initial concern was pollination, but this has turned out not to be a problem with walnuts here, except that seedlings take ages to produce any male catkins. WIG are doing two series of comparative variety trials. It will be several years before any results emerge from these, but they are important because new varieties are being tested, including 3 U.S. selections imported from Australia. There are two NZ Tree Crops Assn trials on my place as well, looking at new varieties, and also having another look at some of the older varieties like Wilson Wonder. So, of the currently available cultivars, what do we know? The strong favourite at the moment is Vern Harrison’s selection, Shannon. Shannon was the most blight resistant tree in the Waikato blight trial. It was the heaviest, and most consistent cropper in the Manawatu trial. From what I hear it is also performing well throughout New Zealand. Rex is the most widely planted variety. As a young tree it was the heaviest cropper in the Manawatu trial, but as the trees developed it was overhauled by Shannon. Perhaps this early cropping ability has been an important reason for convincing growers to plant it. The correlation coefficient (R2) of 0.84 for Shannon shows there was not much variation in cropping between individual trees in the trial. The OnOff ratio is a measure of the crop in an off year compared with the on years either side, i.e. a measure of biennial bearing. The higher the value, the better. Shannon scores highly on both measures, as do Roadside 6 and 12. Dublin’s Glory behaves quite consistently one tree against the next, but are badly affected by biennial bearing. Meyric has a big difference between good and bad trees and terrible biennial bearing. Rex is quite consistent one season to the next, but cropping for individual trees are all over the place. Nut yield is an important consideration. Nut quality is another factor. * new varieties in the WIG trials. Those are the numbers, but grower perception, mine included, can be quite different. So I repeat these comments from a previous blogletter. – Meyric are by far our best nut but the shells we produce in Wanaka seem incredibly fragile, and I have almost reached the stage of abandoning any sort of machine harvesting because I estimate we lose up to 20 % of nuts due to breakage of the shells even when something as light as a quad bike with wide wheels runs over them. – Franquette are often large and thick shelled, sometimes they look externally to be a good nut but on cracking them they have poorly developed kernels, especially if the nut looks “ moist” externally. They are also incredibly hard to dry and several years ago I lost several hundred kgs when although I thought that they were well dried they developed a grey mould both inside and outside the shell whilst in onion bags! 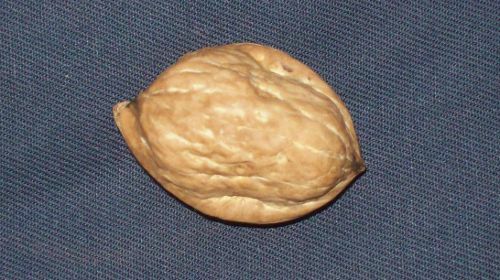 – Stan (Blenheim 300) – a good nut which are easier to process because they are round and do not jam so easily in equipment. Quite a nice nut to taste, relatively early fruiting. – Wild Nuts – we originally planted about 80 wild trees which I regret because some produce quite good nuts but others are small and do not taste very good. A typical Franquette nut with poorly formed shell and rotten kernel that I am putting down to Boron deficiency. The shell is ultra thin along the pale lines. Franquette is a very late leafing variety, and is planted in the South to avoid out of season frosts. I have also found Franquette to be particularly prone to Boron deficiency, so much so that they never cropped at all for years. The comments Jeffrey makes about drying them applies to all the larger nuts. Drying takes much longer and needs to be very thorough. On the other hand we have found that a big nut is much quicker and easier to pick up. The closer you get to Auckland, the more likely you are to try and grow a big table nut. We have bred Roadside 6 and 12 as an alternative to Wilson Wonder. In the Bay of Plenty we find Roadside 12 out performs Wilson Wonder most seasons, but it has a problem with some kernels not being filled out. Roadside 6 seems to avoid that problem, but the nut quality is not quite as good. Every variety has its good and bad points! The interaction of variety with site is critical. I have yet to find a way to make Meyric crop here, but we have no problem with out of season frost on any variety. On the other hand a good hard winter seems to increase our crops through initiation of flowering. It is this site interaction that I am hoping will trigger your feedback. Send me your stories about what varieties you like, and where things have turned out different from expected. I sent a draft of this blogletter to Jeffrey Feint, and got this reply…. Great to hear from you again . We are in the middle of our harvest which is far too late since the leaves have well and truly fallen and for the last 4 days we have had almost constant heavy rain , which has effectively stopped any nut harvesting . On top of that we have had machinery breakdowns – the main motor to our washer , and the hydraulics on our harvester . All in all this tends to make it “ a harvest from hell “ , although after 2 years of very low yields we have a good crop which should come in around 5 tons. Most of the comments I made in an earlier blog are still pertinent to me – our Meyrics remain our best nut but they are so fragile , and after drying and whilst bagging the shells literally seem to fall apart ,and I think that we must lose 20 % or more in fractured shells which are discarded .It has been pointed out to me that if we hand rolled them all then we wouldn’t have all these breakages but hand rolling over a ton takes quite a bit of time and personnel which we don’t really have . Valda Muller points out to me that Meyrics are also very hard to crack mechanically since the bits stick inside the shells , but I don’t really have any other nuts in comparison . In our Central Otago environment Rex seem to be frequently hit by late frosts and this could be due to the fact that they don’t have big leaves like the Meyrics to protect the buds . A problem which I have always found troubling is that we struggle with very small nuts on Rex’s and Blenheims – to make a double entendre no man likes to be told that he has “ small nuts “ , but I have tried extra watering , fertiliser, ‘poisoning’ the trees with boron all to no avail – is this peculiar to the Central Otago environment, the cultivar [ New Zealand cultivars tend to be small when compared with North American cultivars ] , or whatever – can anyone offer any advice on this problem .Some years ago I visited a walnut processing factory in Victoria and I remember the guy showing me some nuts and saying “ These nuts are so small that we just discard them because nobody would eat them “ , sadly they were a lot larger than most of our bigger nuts !. I note that the Rex’s that are mentioned in your blog from Manawatu are not noticeably any smaller than other cultivars . Thanks for your prompt reply Jeffrey. Sorry to hear of your difficult season. Being mechanically challenged, I avoid machines as much as possible. So I use gravity for my harvesting, a hand-held hose over wire racks for my washing, and the only moving parts in my whole system is a domestic dehumidifier and fan in each drier. Of course it helps when my wife does even more than I do. I don’t know why Rex came out so well in my crackout score, but that was the measure I got. Last year I tried hand cracking a sack of Rex nuts and found them much more difficult to get out of their shells than my seedling nuts. I am full of admiration for Jenny Lawrence making a living out of cracking those things. My Meyrics have never produced enough to give me a sack full to try cracking on their own. I also discard a fair proportion of the Rex’s I pick up because they are too small to handle. Thanks. It is great to hear from someone like you who is pushing the boundaries.